1. In a bowl, mix fennel, vinegar, shallot, ginger, lemon peel, and 1/2 teaspoon salt. Whisk in 1/2 cup olive oil until combined, then stir in raisins. 2. 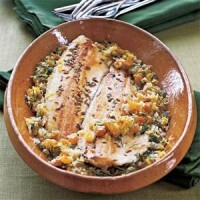 Brush both sides of trout with oil, then sprinkle with salt and fennel seeds. Set a 12- to 14-inch nonstick frying pan over medium-high heat. Pour in about 1/2 teaspoon olive oil, then wipe pan with a paper towel. Set fillets skin side down in pan. Cook, turning once with a spatula, until surface is lightly golden and fish is opaque in center of thickest part, 5 to 6 minutes. 3. Transfer each fillet to a plate. Whisk vinaigrette to combine and then spoon over fillets.